﻿We’d hoped to coastal hop again today, but a forecast of thunderstorms throughout the day encouraged me in the direction of the ICW. Yesterday afternoon was enough thunderstorm adventure. Dobbs did most of the steering because I really don’t care for thunderstorms. I stay below and help navigate by checking for ship traffic on AIS and monitoring weather radar. I make all the meals and keep the boat tidy. When there’s cell signal, I update our blog. 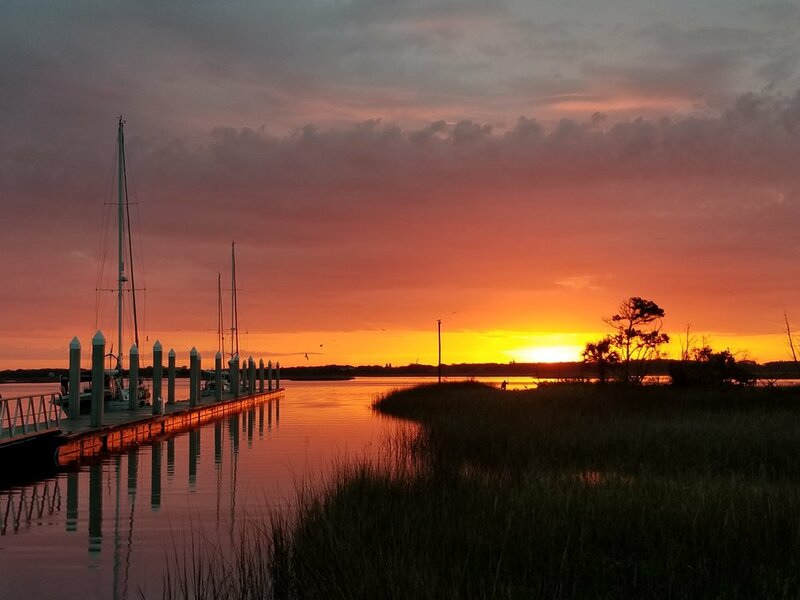 Initially, our goal was the northern end of the Brickhill River in GA, but we made sufficient good time to continue across St. Andrew’s Sound to Jekyll Island. We spied wild horses walking along the sandy shore near the north tip of Cumberland Island - what is actually Little Cumberland Island. At 4pm, we stopped at Jekyll Harbor Marina for diesel, ice, water, and dog walk. The dock hand was super friendly and helpful. Dobbs offered him a tip, but he politely refused. We moved off to anchor in the area opposite the boat ramp and due north of Red #24. We had some snack and G&T’s while I put away charts, life preservers, binoculars, etc., and then moved right to dinner. I made pan-roasted sweet potato slices with smoked sausage and a side of peas. Our appetites were fresh. Dobbs climbed into bed shortly after dinner and he’s up there snoring away, Murphy tucked under an arm and Max at his feet. I washed the dishes and put on my pajamas, and now I’m enjoying this quiet (well, except for the snoring) time before bed.